Bypass Kenya's unreliable telecommunications network by subscribing to our international conference calling plan with no prepayments, no contracts and no minimum usage requirements or recurring charges of any kind. As a customer of aitelephone.com, you can enable the international conference call superior network quality and take advantage of low per minute rates. Host Kenya conference calls with attendees located in any country worldwide. 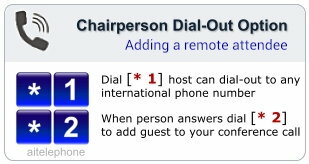 If you want to hold an international conference call from Kenya, attendees in Kenya dial a Kenya-specific toll-free phone number while attendees in other countries will dial different access numbers based on the countries they are calling from. All worldwide access numbers are sent to you upon account activation -150 global access numbers. Each caller will be dialing a conference access number located in their own country. Optionally, you can use the "dial out" feature to dial attendees into your call directly. Enable all participants to collaborate on the same Kenya call with a high quality connection. It is generally considered inadequate and inefficient. The only fixed line telecommunications provider is Telkom Kenya; however, privatization plans are in the works, according to reliable sources. The telephone network in Kenya relies on microwave radio relay though a VSAT system is used for transferring business data. Teledensity in Kenya is 65 per 100 people as of 2011. Roughly 283,000 landlines were in use in 2011. In contrast, mobile cellular usage that same year exceeded 28 million. Multiple cellular providers operate in Kenya, allowing for robust competition and prompting widespread adoption of mobile cellular. Kenya serves as a landing point for several submarine fiber optic cable systems: TEAMS, EASSy, and SEACOM and is connected to the world via several Intelsat satellite earth stations. International direct dialing, subscriber trunk dialing, fax, mobile telephones, telex, and other voice and data services are provided by Kenya Posts and Telecommunications Corporation. Antigua, Argentina, Australia, Austria, Bahamas, Bahrain, Barbados, Belarus, Belgium, Bermuda, Botswana, Brazil, British Virgin Islands, Canada, Chile, China, Colombia, Costa Rica, Cyprus, Czech Republic, Denmark, Dominican Republic, Ecuador, Finland, France, Germany, Greece, Hong Kong, Hungary, India, Indonesia, Ireland, Israel, Italy, Jamaica, Japan, Kenya, Korea, Luxembourg, Malaysia, Malta, Mexico, Montserrat, Netherlands, New Zealand, Norway, Panama, Peru, Poland, Portugal, Puerto Rico, Russia, Saudi Arabia, Slovakia, Slovenia, Singapore, South Africa, Spain, St. Kitts/Nevis, St. Lucia, St. Vincent, Sweden, Switzerland, Taiwan, Thailand, Trinidad, Tobago, UAE, UK, Uruguay, Venezuela, Vietnam. Kilifi or from any Kenyan city that can access the included Kenya toll-free access number. Optionally the chairperson or attendee can use the free 'Connect' app using wifi to trigger a call-back to his/her phone to enter the Kenya conference call. For instance, your associate in Kenya can join a conference call with partners in the UK and the U.S and an IT professional located in India plus your marketing division in Germany -all on the same call. 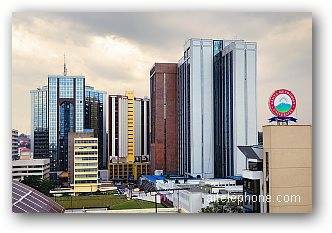 If you're located in Kenya, you have collaboration options beyond what Telkom Kenya offers. Enjoy convenient, high quality conference calls from Kenya using toll-free access. A Kenya Conference Call is the solution to join multiple countries on an international conference call using supplied in-country Kenya toll-free access number.